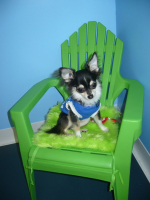 Small Paws is a safe, fun environment for small dogs to play, run, socialize and just be dogs. Included in the price of daycare is walks, cuddles and daily updates to our Facebook page. We want to make the experience not only fun for your furry best friend, but a nice place where you can confidently drop your dog for a day of play. - Feeding, if requested. Bring your own food, marked with your dog's name. Contact Nigel at the daycare (info@smallpaws.ca) to ask about dates available and rates, as it does fill up fast. Drop-in nail trims offered on Wednesday and Thursday mornings for all dogs. Appointments not necessary but call ahead in the morning to ensure the groomer is available: 778-370-0456. (Such as Chihuahuas, Boston Terriers, pugs). Shampoo, blow dry, brushing, nail trim, ear cleaning. (Shampoo, blow dry, brushing, nail trim, ear cleaning, haircut of choice). Price depends on breed, coat and cut style. (Shampoo, blow dry, brushing, nail trim, ear clean, shave paws and around eyes, tummy and rear). * Please note that some breeds such as Shelties, Cocker spaniels, American Eskimos and Pomeranians may be extra. Please ask for a quote. No sedation used for this painless, manual teeth-scaling service provided by K-9 Teeth Cleaning. Offered on the last Friday of every month, with prices ranging from $140-200.